Ultra tough, ultra bright, military grade tactical flashlight. You know how you can&apos;t see for a couple minutes after someone takes your picture with their phone? When you turn on the Bearclaw Tactical Flashlight, you get a light that&apos;s 100x brighter and stays on as long as you want, giving you the upper hand in any situation. But it&apos;s not just about blinding an attacker and overcoming your opponent, it also works great to light up anything or anywhere you need, just like its a bright summer day. Don&apos;t get left in the dark! The Bearclaw Tactical Flashlight is an ultra bright 800LM/2000 LUX flashlight, with an adjustable and zoomable focus. It&apos;s under 6 ounces and is still skid and water resistant! Drop it from a building, run over it with a truck, or submerge it in boiling water and it keeps on shining. The strobe feature can disorient attackers. Runs from 3 AAA batteries or one 18650 3.7V battery (not included). 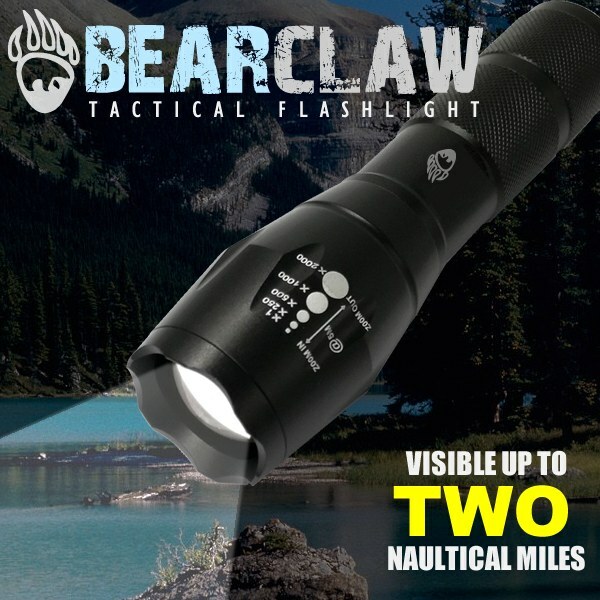 Buy the Bearclaw tactical flashlight today. Measures 5.35 x 1.38 x 1.02"
Excellent product. Very handy for evening emergencies or when there is a power failure. Keep the flashlight in my vehicle at all times and have a spare for emergencies in the home. Great Flashlight! Really helps to get around in the house at night, so you don&apos;t have to turn on the lights. This is the handiest flashlight I have ever found. I like a lot of light, but the big maglites are heavy and hard to always have handy. I have one of these in the 3 places I don&apos;t want to end up in the dark. We love this flashlight it works great! Does everything that it says it will do. Perfect for emergencies when the electricity goes off during storms. Will enable us to get around easily and be quite comfortable in the dark. Does everything it said it would! Great gift, My kids loved it! Great. No black spot in the middle of the illumination like other flashlights. I bought this Flashlight a couple months ago and I have used it a few times already and it does the job as advertised. It is well built and I love the fact that it uses regular alkaline batteries as opposed to the expensive sometimes hard to find types of batteries that other lights in this class often use. Great product,I&apos;ll be buying more.I highly recommend this,brightest flashlight I&apos;ve ever had. Love it, very bright and adjustable. Very bright!!! Gave it to my mom for power outages and she loves it. A must have for every glove box. I think for the price that these lights are great. I bought two and use them when I need a bright light. I would recommend it for any purpose where you need a bright light. Good product. Love it! Recommend it! Puts out a LOT of light. Provides security in a dark area. VERY HAPPY WITH THE TWO FLASHLIGHTS.